This beautifully designed journal-just for women-will delight and inspire readers in their daily faith walk. Two hundred comforting readings offer just the encouragement they need to face the day, along with lovely little reminders that Jesus has a very special message just for their hearts. 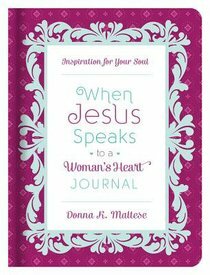 About "When Jesus Speaks to a Woman's Heart Journal"
Donna K. Maltese is a freelance writer, editor, and proofreader; publicist for a local Mennonite project; and the assistant director of RevWriter Writers Conferences. Donna resides in Bucks County, Pennsylvania, with her husband and two children. She is a pastor's prayer partner and active in her local church.